Audio Debate Transcript: 09-11-11: "9/11's Footprint on America Ten Years Later"
The transcript of the debate follows below. We encourage everyone to read this carefully to understand the true character of our county's enemies. We will be going through their statements point by point to identify existing video/audio/text to refute them. We will add our own where we need to. Our intention is to produce text and video responses for widescale distribution. If anyone would like to participate in the complete dismantling of these ridiculous and unethical 'arguments' we would welcome your help. We are a small group but determined. Email us at the following address. Thank you. 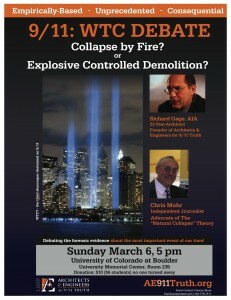 DENVER, March 4, 2011 /PRNewswire/ -- Colorado citizens are among the nation's leaders in pursuing the growing questions of what really happened on September 11, 2001. 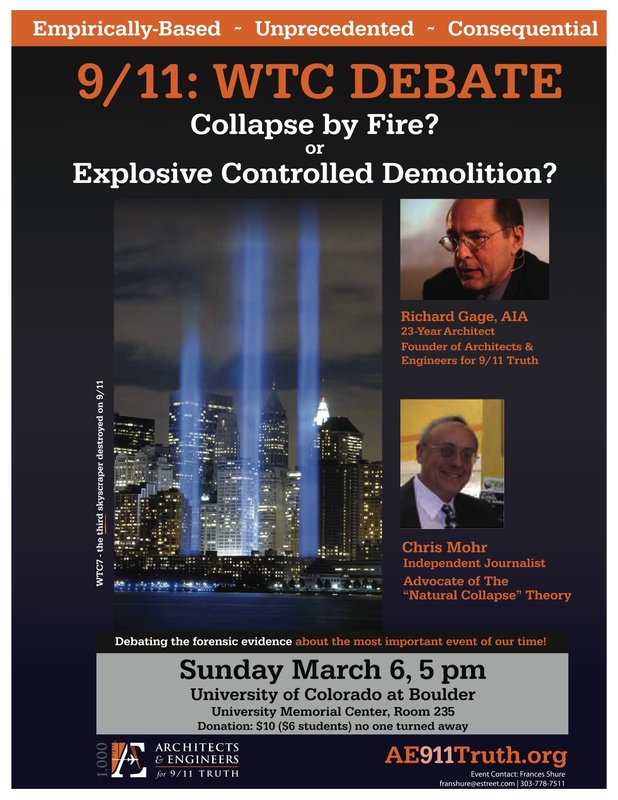 1) On Sunday March 6, 2011, Colorado citizens will sponsor a debate at the University of Colorado at Boulder exploring the question, "What brought down the three World Trade Center Towers?" This is a documentary commentary on 9/11 Truth and the 9/11 Debate: Jon Gold Vs. Pat Curley, which took place November 24, 2008 on the Franklin Pierce University closed circuit television show, “The Dynamic Duo”, was moderated the show's hosts Justin Martell and Eric Jackman, and is now on youtube. 1. Are there unanswered questions? The physics of 9/11: why do the rumours live on? 9/11 Truthers, the laws of probability ... and the laws of science. Jefferson Flanders is a professor of Journalism at New York University. Visit jeffersonflanders.com. Michael Keefer is a professor of English and Theatre Studies at the University of Guelph. Visit his faculty web page. University of Wisconsin law professor Ann Althouse has upped the ante. Now she says 9/11 truth is not just "truly nutty," it's "despicable," and 9/11 truth-seekers are like "Nazis or Klansmen." If it's that nutty and despicable, it ought to be easy for a law professor to shoot down in a debate. But once again, Ann has taken the cowardly route of hurling vicious insults while refusing a polite offer for a debate based on logic and evidence. Below is my recent correspondence with her. I am writing to request that you back up your characterization of 9/11 skepticism as "nutty," and your many public attacks on me, by stepping forward to defend the official story, using logic and evidence, in a free and fair debate. As you may know, last year the UW-Madison History Club attempted to sponsor a debate or panel discussion pitting critics of the government's version of 9/11 against its defenders. After thoroughly canvassing the UW faculty, especially the History and Political Science departments, they were unable to find any defenders. I had a bunch of 9/11 truth debates recently, and there is one tactic I find to be useful that I wanted to share. It is simply trying to structure your debate so that your opponent has to prove a point. For instance, if the debate is all about you having to prove that 9/11 was an inside job, then they can just ignore you, or choose not to believe facts. If the debate is about them trying to prove something -- for instance, that bin laden did 9/11 -- then you can use your knowledge to shoot them down, and to prove that they are just a dumb sheeple who doesn't know anything and who needs to wake up ASAP.